It ended up being some really loud thunder and lightning last night. It stopped around 11:00pm, or that is when I fell asleep. The tent stayed dry for the most part. Gabe woke me up and I got up a bit later. Did the coffee/breakfast thing and got things packed up. Gabe wasn’t done yet so I sat on a log and queued up photos to upload when I get cell service/wifi. It was a nice walk to the new Suiattle Bridge this morning. The old bridge got washed away in 2003 and they completed a new one in 2011. Only downside is that it added about 4.8 miles to the PCT length. Some people still take the old route and cross on a log that happens to be there. Once the log goes, this old route will probably cease to exist…unless a new log appears. The trail passed some VERY old trees that were VERY huge. It is a shame there are hardly any of these trees left. Back when I was with an environmental group in the 90s I had a guy tell me that “God put the trees on Earth for man to use”. I really screwed up because God had this guy on his speed dial and I could have gotten a few questions answered. Gabe and I spent awhile at the new bridge taking photos and video. There were these sandfly like bugs flying around and biting our legs. I hadn’t experienced those buggers since New Zealand. Went to switch camera batteries and realized I had used up my 4th and last one. I cursed myself a little for not bringing my fifth one. Hopefully I can squeeze enough power out of the other ones until we get to Stehekin tomorrow. I paid a visit to where the old Suiattle River bridge used to be but couldn’t find any evidence of where it had been. The whole area had been wiped out by a flood. right pocket. Everything was amiss until I corrected it. It is kind of funny how everything has its exact place now. Ran into RWE a bit up the trail. She walked with Gabe and I for awhile. When we reached Suiattle Pass the trail started dropping down into the valley a bit. I pretended to answer my phone as if we had suddenly received service after crossing the pass. The rain really started to come down so I stopped and put my rain gear on…rain pants and everything. We went through a basin full of boulders. Along with the river, this was the other highlight of the day. The trail climbed a little bit and I frantically had to take my rain gear off, it was turning into a sauna. Gabe asked if I listened to all the thunder last night or put on a podcast, he ended up putting on a podcast. I told him I listened to the thunder….the “thunder podcast”. It was free, it had good sound quality and most important, the hosts actually stayed on topic and the podcast didn’t turn into an ADHD tangent farm. He said maybe camping down in the forest wasn’t such a bad thing after all…camping on a ridge during the thunderstorm would not have been the best thing. Going into the second basin there was water coming down through the brush, over the grass and everything. It was then running down the trail a long ways. We wondered if a rock slide had happened above or something. Water doesn’t usually come pouring down over green grass with no nearby creeks around. I built up a little dam and got most of the water off the trail. We got to the bottom and there was a large amount of dirt that had been washed off the trail. It was getting late and would be dark in a couple hours, so we decided to walk the 2.5 miles to Hemlock camp. We got there and a sign indicated it was not safe to camp there, falling trees everywhere. Gabe and I searched out other spots but they all had issues of some sort. We took a little break and then decided to just push it another 2.8 miles to Cedar Camp. Once we hit the forest again Gabe remarked at how much darker the forest was…it should have its own time zone. It ended up being a really fast walk, we were going about 3.3 miles an hour. Fortunately the rain held off. We got to the camp and saw RWE moving around, it looked like she had gotten there maybe 30 minutes before us. Another guy in a tent told us there was a spot down by the river, where we are now….no van to live in though around here by the river. Today I passed the mark where it is less than 100 miles until I am done. I could be done in 4-5 days but Cora is meeting me a bit later, so I have some time to kill. Nine miles to the road tomorrow, to where we catch a shuttle bus to Stehekin. We are hoping to make the 12:15pm bus, shouldn’t be a problem unless we sleep in. What you can't see is water dripping everywhere. The new bridge over the Suiattle River. 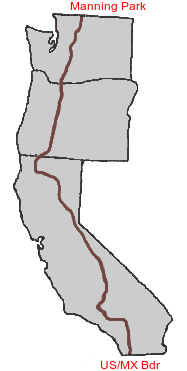 The location of the bridge added about five miles to the PCT in 2011 when it was completed. Drying out my rainfly in the few minutes of sunlight we had today. The valley that we drop into to get to Stehekin. Not what we expected to see when we got here. Looked for a camp spot on the other side of the broken bridge but did not see anything.